“B.B. King welcomed me into his inner circle like few others. He was ever so hospitable – “Want something to eat? Want something to drink?” Backstage with B.B. and his entourage I felt as if I was a guest at his home. I took B.B. King out to the Palace of the Legion of Honor in San Francisco where there is a copy of The Thinker, the famous statue by Rodin in the courtyard. I posed B.B. 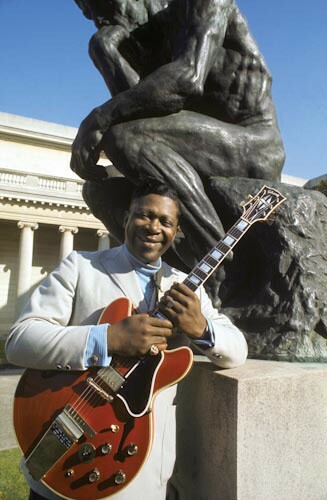 against this statue so that Lucille, his red guitar, and the arms of the sculpture are kind of parallel. It’s a beautiful shot but most people don’t quite understand what I was trying to do, what I meant by the slightly ironic juxtaposition.” Read more in the book.